Troubleshooting pilot light problems on gas water heaters. How to fix the water heater when the light goes out, does not light, won't stay lit, the pilot flame is too small or too large. How does it work a how to recognize is it operating correctly or not? What is a pilot light and how does it work? A pilot light is a small device that is designed to provide the flame and light the gas coming out of the gas valve and main burner. It is common on fireplaces and older/cheaper furnaces and water heaters. A pilot light is always burning while using a small amount of gas, either a water heater is running or not. Once there is a need for heating, a gas control valve releases the gas into the main burner, and the pilot light ignites the gas. Except lighting the gas burner, the pilot is used to heat the thermocouple, creating electricity small enough to hold the electromagnetic valve inside the gas control valve open. If there is no pilot light or is blown out, the tip of the thermocouple cools off and stops generating electricity so the gas valve closes and the unit shuts off. Every gas appliance is equipped with similar safety devices, prevent gas leaking inside the house. The pilot is widely used due to its proven and reliable work, but its main disadvantage is wasting gas when not working. To prevent problems with the water heater pilot light, it is crucial to read the manufacturer's instructions carefully, especially how to maintain the gas water heater and how to light the pilot. Otherwise, if the pilot light is not functioning correctly, the unit won’t turn ON, and you won't have hot water. Note that most of the older and economy gas water heaters are equipped with the pilot, while newer, advanced models utilize piezoelectric sparks or a hot surface igniter which is more durable and reliable. Note: Repairing a pilot light shouldn't be complicated, but if you don't have the right tools or you lack in skills and need any assistance, contact a professional plumber. Did you know that by looking at the pilot flame you can say is it working as it should, or not? A typical and healthy pilot should burn with a bright blue luminosity, not a yellow or red. A yellow flame means that there is no sufficient air flow, that the gas combustion is not complete or the pilot tube is dirty. A flickering or wavering flame is an indication of the draft. The dirt inside the tube causes a split flame. Most of today's energy efficient water heaters will produce a certain amount of condensate. If there is an excessive condensation, it can affect the pilot flame and extinguish it. The condensate, in this extreme case, is running down the flue tube and is dripping on the burner assembly, which results in the pilot outage. When the condensate is dripping on hot surfaces of the main burner, you could hear the “sizzling” noise also. There are several reasons why condensation happens, and some include high efficient water heaters which produce flue gases with the lower temperature, undersized heater, when the incoming water is very cold and when you start the unit for the first time. Check out this article to learn more about condensation and its effect on the water heater. Most of the time improper venting would cause the pilot outage on direct vent gas water heaters (DV). Down-draft from the ceiling fan, draft at the bottom of the unit, or high winds are also common reasons when the pilot would go out. If there is a restriction in the fresh air delivery, find the reason and remove the obstructions. The right amount of air should be delivered when the unit is installed in the small confined space. If the wind is blowing directly into the DV vent, it may cause the pressure imbalance. If the water heater is installed in an attic, an excessive heat (above 120 C) could be another reason. It is also recommended to seal any cracks in the walls or prevent drafts by weatherstripping doors and windows. If the pilot line is clogged, clean it or replace it. Faulty piezo igniter. The water heater uses the piezo igniter to light the main gas burner, and when it is pressed down, it releases the electric spark. The spark gap is factory set (0.125") and should be maintained. When troubleshooting lighting problems, it is recommended to test it first. Turn the gas OFF to the water heater and press the piezo igniter. Once pressed, the electrode should release the spark. Check if the wire connection is properly tightened. Make sure the electrode is not broken, and replace it if it is. Soot and/or carbon deposits on the pilot light. Clean the tip of the electrode from the dirt, rust, and other deposits by using the dry cloth and sandpaper. When troubleshooting the pilot light problems such as when it does not stay lit, keep in mind that there are often different causes for this and other conditions. If there is no gas or gas pressure is too high or low, check with your utility company to see if there is any work on the system. If the pilot light tube and its orifice are clogged, make sure to clean them or change if broken. The gas valve and its inner elements are faulty - replace the whole gas control valve. If the thermocouple connection is loose, tighten it, and if you have the faulty thermocouple, replace it with the new one. The gas control valve should be creating at least 10 millivolts. The thermocouple should be embedded in the flame and tighten correctly - first hand tighten it and then use the wrench for additional 1/4 turn. Replace the thermostat (gas control valve) if the thermostat ECO switch is open. The air present in gas line could prevent the pilot light from lighting. Purging the air from the gas line should be performed by the professional. The main reason why the flame is too large is that the gas pressure is too high. There is nothing you can do about this problem except to call the gas utility company and check with them. Make sure you don’t have the wrong size of the pilot burner orifice. Also, some homeowners reported that while they were cleaning the unit, a small orifice cap found on top of the pilot tube fell out making the pilot light unstable, yellow and very high. If the gas pressure is too low, the flame can become too small. Check with the utility company about this problem. Also, a pilot light tube and its orifice might be clogged with the dirt coming through the gas line. Some elements you can clean, but if there is dirt in the incoming gas line, you should notify your utility distributor and check with the gas technician about installing the dirt trap in the gas line. 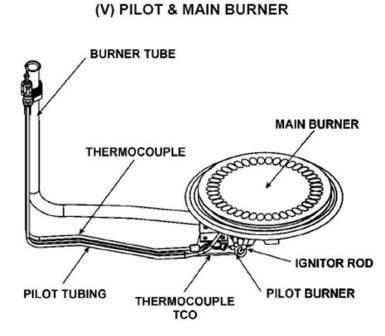 If you have the wrong pilot burner replace it with the correct one. Important: Before troubleshooting the pilot light, keep in mind that a pilot flame is always ON and the flame should be blue. If it is yellow, it needs an adjustment. Make sure that the tank is completely filled with water before lighting the pilot light. Note: If you need a help, contact this plumbing company to send you a professional. Pilot light goes out after the water heater has been running for a few minutes.